Before buying roses you should survey the area where you will be planting them. Most roses require 6-8 hours of direct sun and can withstand full sun in our planting region. Next, pick roses that are disease resistant. Buy roses from a reputable nursery, check the labels on the roses you are planning to purchase or go to helpmefind.com/rose. Help Me Find lists thousands of roses with information about each. See if you can find an in-ground example of the rose(s) that you have selected. We are blessed with two very good rose gardens in this area. The San Jose Municipal Rose Garden has mainly modern roses. 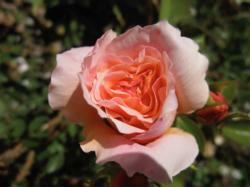 The San Jose Heritage Rose Garden has old and rare roses that are, generally, harder to find. Don't forget about size. Roses range from small to very large. You don't want to put a six foot tall and wide rose in a four-foot space. Most modern roses are repeat bloomers but some only bloom in the spring. Many older roses are also once bloomers. Make sure your rose is the type you want. If you purchase your rose(s) in January or February, they will generally come as bare root plants. After February, most nurseries pot up the plants. Bare root roses are generally less expensive than potted roses. Much of the soil in our area is heavy clay but there are many areas of loamy soils. Check to see what kind of soil you have. This will have a direct effect on the amount of water you give your plant. Prepare your planting area by digging a hole that allows you to spread out the roots of your plant. If your rose is in a pot, you need to dig a hole that is half again the size of the pot. The bigger the pot, the bigger the hole. Mix a small amount of compost with your soil, then plant the rose with the crown of the rose just above the soil line. This allows for settling and for draining water away from the crown of the plant. Be sure to water the plant well to help settle the soil around the roots. If the weather is warm when you plant your rose, be sure to check the soil moisture level frequently. If you have planted your rose in the winter months, rain may do the watering job for you. In our area, pruning is generally done in the winter months. This is when roses are at their most dormant. Because of our Mediterranean climate, roses usually don't go completely dormant. The old idea that roses should be cut down to a few canes only 8-10 inches tall does not apply in our climate. If your rose is in its first year in the ground, it will need very little pruning. Removing dead material from a first-year rose is all you have to do. 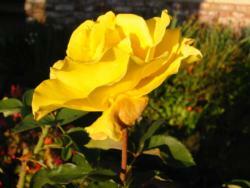 For more mature plants, the rose should be cut down only 1/3 to 1/2 of the height. Taking out dead canes and shaping the plant should be the most you will have to do. Remove selected old canes, diseased canes, and crossing canes. This will allow air to flow freely in and around the rose, thereby reducing the chances that fungal disease will attack the plant. If you have not pruned roses, the San Jose Heritage Rose Garden offers free pruning classes every Wednesday and Saturday, starting in January and continuing through February. Classes start at 9:00 a.m. You can practice your pruning techniques on the roses at the garden. Once established, your rose's watering needs are dependent on your soil conditions. Adobe or heavy clay soils retain a lot of moisture, so weekly watering may be all it needs. Loamy soils do not retain as much water as adobe and your plants may need more frequent watering. Check the moisture level weekly until a watering pattern can be determined. Usually, watering for established roses will be every 7-10 days. Placing a good layer of mulch around the plant will help retain soil moisture that will reduce watering times, keep weeds from germinating, and add nutrients to your soil. The most beneficial time to water is early in the morning. Do not overhead water your plants; this will keep the leaves dry and help prevent fungal diseases. If you choose to water in the evening, do it early enough so the plant leaves will dry before the sun sets. Deadheading your roses means taking the spent blooms off your plants. Most roses sold in a local nursery are reblooming. Deadheading will encourage your roses to bloom all season long. The best way to prevent diseases is to carefully select a rose that resists the main diseases in our area: powdery mildew, black spot, and rust. 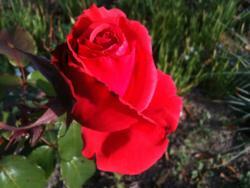 Look for roses that are marked as disease resistant. 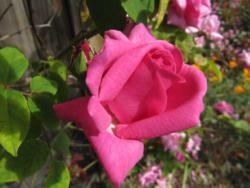 The Help Me Find website will give you information about a specific rose's disease resistance. The master gardeners do not recommend spraying with harmful fungicides and pesticides. For fungal diseases, select an organic spray or, better yet, wait for warmer weather. Sunny, warm to hot days will kill most fungal diseases. The number one pest of roses is aphids. Aphids are particularly troublesome in the early spring and there are a number of ways to take care of these small pests. The following steps may be helpful: squash them with your fingers; blast them off with a hard stream of water from the hose; spray with an insecticidal soap solution bought at your local nursery; or wait for natural predators like ladybugs and lacewings to arrive and have a feast on your aphids. At the San Jose Heritage Rose Garden, the last option is used successfully each year. Another pest is thrips and they are very hard to control. For information on thrips and other rose pests, visit the UC Pest Management site's page about rose pests and diseases. Roses beautify your garden, provide fragrance, can be cut for floral arrangements and they are long-lasting. Like all other plants and flowers, if given the proper care, they will give you pleasure for many years. If you have any more rose questions, contact us for more help! Good luck and happy rose growing.